orbital period of the planets. You surely know that planets orbit around stars, but have you ever wondered what is an elliptical orbit? As the name suggests, planets do not move around a circle, but on an ellipse. Use ellipse calculator to learn what is an ellipse and how to estimate all the parameters of an ellipse. 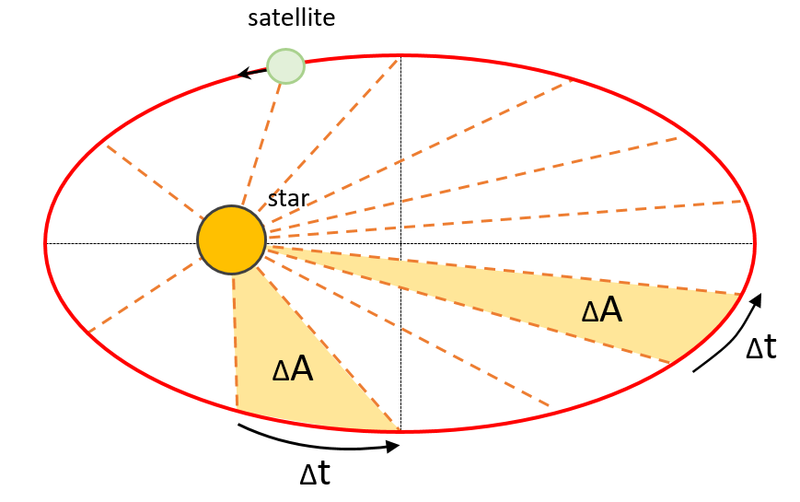 With our elliptical orbit definition, you will be able to find what is Earth's elliptical orbit including its apogee and perigee distances and Earth's orbital velocity at those points. 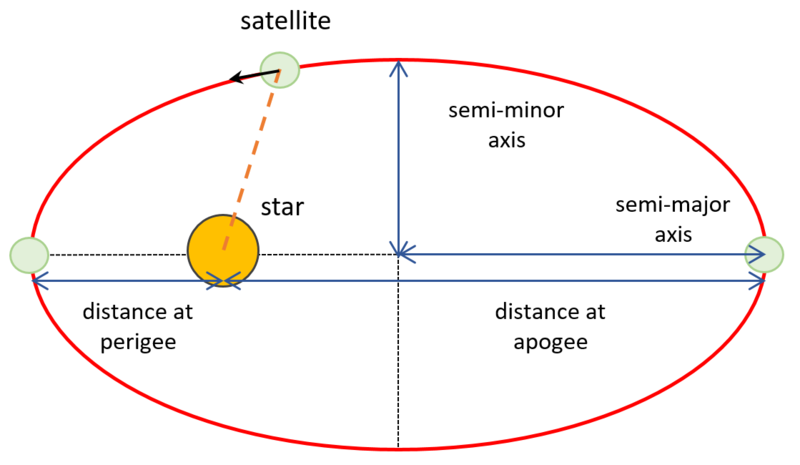 The apogee and perigee are respectively the farthest and the closest points at which the Earth can come to the Sun (in many calculations we often use just an average orbital radius of Earth). Our orbital velocity calculator makes use of several astrophysical relations. For example, to describe the geometrical properties of Earth's elliptical orbit you only need to know the semi-major and semi-minor axes or the eccentricity of Earth's orbit. If you want to find more details, like Mars' orbital period or its satellite speed, you should also enter the masses of the star (e.g., Sun) and the satellite (e.g., Mars, Moon). We can compute it with the Kepler laws and the orbital velocity equation. Finally, with the so-called vis-viva equation, you can find out what is, for example, the orbital velocity of the Earth. At the end of this orbital velocity calculator you can find the planet data table with orbital parameters of different planets of the Solar System. Are you interested in problems of astrophysics? Try our escape velocity calculator or rocket equation calculator! b is the semi-minor axis. rp is the distance between star and satellite in perigee. The only thing we need do is to solve the above system of orbit equations. You can, of course, use our orbital velocity calculator to do it! For example, you can analyze Earth's elliptical orbit. The semi-major axis of Earth's orbit is a = 1 a.u. (1 a.u. is one astronomical unit which is an average distance between the Earth and the Sun), and the semi-minor axis of Earth's orbit is b ≈ 0.99986 a.u.. Therefore eccentricity e = 0.0167, distance at apogee ra = 1.0167 a.u. and distance at perigee rp = 0.9833.
m is the mass of the satellite. The standard gravitational parameter μ is expressed in SI units m³/s², but in the scientific literature and spacecraft navigation we usually use the units of km³/s². With above orbital speed formula you can also estimate the satellite speed at apogee (r = ra) and perigee (r = rp). With orbital speed calculator you can compute that the orbital velocity of the Earth at perigee is vₚ = 30.29 km/s and at apogee is vₐ = 29.295 km/s. First law of Kepler - the law of orbits. Every planet of the Solar System moves around the Sun on an elliptical orbit. It is important to remember that the Sun is not at the center but at one of the two foci points of the elliptical orbit. Check our ellipse calculator if you want to find out what is focus point. Second law of Kepler - the law of areas. At equal intervals, a line segment between a planet and the Sun sweeps out equal areas (area speed is constant). We encourage you to try our orbital velocity and calculate the orbital period of the Earth (a = 1 a.u.). You will see that it equals precisely one year. You should note that the orbital energy of the Earth (and other planets too) is large (~ 10³³ J). Check our energy conversion calculator if you want to find out what are other orders of magnitude of energies that can be found in nature. Are you looking for Neptune's orbital period? Or maybe you're interested in Jupiter's orbital speed velocity? 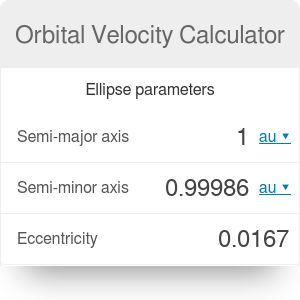 If you want to quickly estimate orbital properties of different planets in the Solar System, you can use our orbital velocity calculator alongside the below planet data table. With the information from the above planet data table, you can compute every orbital parameter provided by our orbital speed calculator. Try with different planets! Just remember that the distance between a planet and the Sun is expressed in astronomical units (average orbital radius of the Earth) and the mass is in units of Earth's masses. Orbital Velocity Calculator can be embedded on your website to enrich the content you wrote and make it easier for your visitors to understand your message.